The practice of Yoga encourages a deeper mind-body awareness. Through healing and balancing the physical body, the mind gains clarity and focus as well. 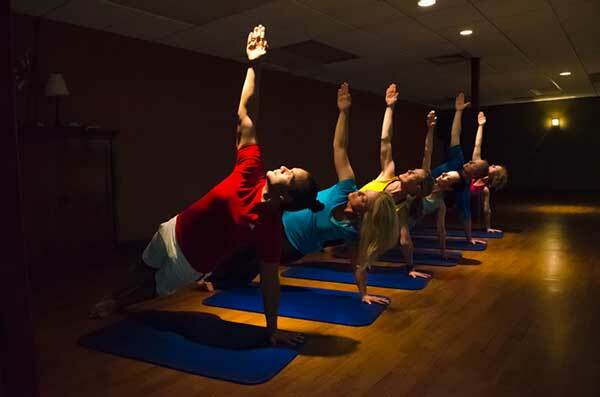 Club Fitness offers a variety of Yoga classes for all levels. Beginners start with a flowing set of poses that serve to open the body, strengthen and stretch the muscles and calm the mind. Intermediate classes progress to a more vigorous set of poses that includes strong standing, balancing poses and backbends. Choose the class most appropriate for your level of practice. Several Yoga classes are available daily at the Green Valley location. All Yoga Classes are 60 Minutes. A class appropriate for new students/beginners, students who have limited strength & flexibility, students recovering from surgery or injury or students who just want to enjoy a class that is accessible to everyone. Basic standing poses, some balance, gentle backbends, alignment principals & yoga breathing will be introduced in this class. This class is a step or 2 up from Gentle/Beginner, learning more balance poses, learning sun salutations in a slow, modified way, building strength with planks & down dogs with modifications if needed, being introduced to deeper forward & back bends. This class is appropriate for students who have some yoga experience, wanting to grow from gentle, ready to challenge a bit more, it is also fine for beginners, if they already have a fitness regimen of any sort, have some body awareness of strength & flexibility and no significant injuries. This class continues growing from Yoga 1, more strength poses, more balance, more challenging flow sequences, deeper forward bends and backbends. Students may also be introduced to inversions, always with modifications. This is Not a beginner class, students are encouraged to have at least 3 months of asana practice. This class continues growing from Yoga 2, students are introduced to intermediate & advanced postures, including full inversions and more challenging flow sequences & will explore some of the deeper aspects of yoga, learning more of the 8-limb path. Students should have a solid understanding of yoga breathing & alignment principles. This is Not a beginner class, students are encouraged to have at least 6 months of asana practice. Slow movement combined with deep stretches and praynama (yoga breathing) in this slower paced class. Students will leave class feeling stronger, stretched out & renewed. This class is appropriate for students who have some yoga experience, wanting to grow from gentle, ready to challenge a bit more, it is also fine for beginners, if they already have a fitness regimen of any sort, have some body awareness of strength & flexibility and no significant injuries. This class focuses more on movement & breath with some standing poses. Although this class may feel a bit more challenging for some students new to "flow," the practice is very adaptable to each one's individual ability. This class is suitable for all levels with knowledge it is a "movement" class. This class focuses more on movement & breath with some standing poses. Although this class may feel a bit more challenging for some students new to "flow," the practice is very adaptable to each one's individual ability. This class is suitable for all levels with knowledge it is a "movement" class. Mixed Level Flow with a bit of heat added to room. This class is a sweaty, challenging practice that moves at a faster pace. Students are encouraged to work at their edge in order to build greater strength & flexibility. Intermediate & advanced poses may be included, such as inversions and arm balances, with options available. This is Not a beginner class, we STRONGLY recommend 6 months of yoga asana practice. This is a group training mat class, performed on the floor, using just your body weight and small props to increase the intensity. Class focuses on core strength and stability. Come sit, connect with your breath and quiet the mind. Our on-the-go lives are filled with work, hobbies, activities, family obligations, community engagements and, often, stress. We don’t always take the time to wind down in a healthy, purposeful manner. Learn to let go and harness the beneficial properties of stillness. Meditation classes at Club Fitness offer the chance to learn relaxation techniques and free your mind from its constant, busy chatter. Find peace and calm in the midst of your active life.